A desi rasta tour | It's a Miracle! Leisurely stroll through Dronningens Gade, or Main Street in Charlotte Amalie on a day when there are no Caribbean cruise ships docked in the harbor. You’ll see a lot of shuttered shops. You might think you’re in a quaint town in the quiet Virgin Islands… I don’t blame you. Let us go back a few centuries to when it all began. In 1493, on his second voyage, Christopher Columbus passed by the island of St. John and skirmished with the Carib inhabitants of St. Croix. That is how he discovered the Virgin Islands. Now, as a child, I was taught – as I’m sure many of you were – that Columbus discovered America. Of course, it isn’t a secret that Columbus wasn’t a genius at navigation: as any of the native peoples of North and South America, unfortunately lumped together as “Indians” will tell you, Columbus was looking for the real Indies. There is also the minor point of how exactly he discovered continents when people had already been living there for centuries. And even by Eurocentric standards, Columbus flops: he wasn’t even the first European to set foot in the New World. But back to Columbus in 1493. On seeing what are now called the Virgin Islands, he named them – Santa Ursula y las Once Mil Virgines after the legend of Saint Ursula and her 11,000 Virgins. I don’t know much about Saint Ursula, but I am pretty sure Columbus wasn’t talking about Ursula Andress. In any case, his catholic act of discovery set the stage for the subsequent enslavement and decimation of the local Arawak tribes on St. Thomas, and the total deforestation of the island. A few centuries later the Danes decide they want a piece of the pie. Now, I don’t know about you, but normally, I don’t think of the Danes as colonialists capable of atrocities on the same level as the imperial British, French, Spanish, Portuguese, Dutch, Germans, or Belgians. Sorry, Denmark. My mistake. I recently found out that it wasn’t really for any lack of effort. 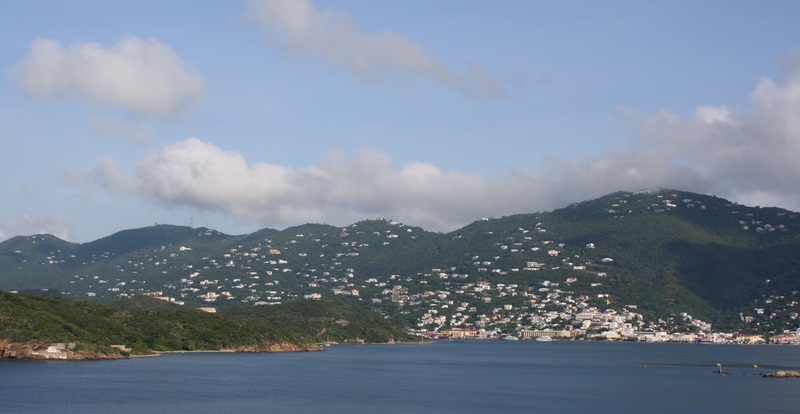 Interested in the West Indies, the Danes build colossal sugarcane plantations on St. Croix, but failed to grow the crop successfully on St. Thomas because of the hilly terrain. Instead, in 1673 with the arrival of the first ship carrying slaves, Charlotte Amalie on St. Thomas becomes the slave capital of the world; and by certain estimates, from 1733-1782, over 123,000 slaves were brought over from West Africa and sold on the island. In the late 1700s, Charlotte Amalie was “declared a free port for intercolonial trade”. Chew on that statement for a bit. And when you’re done, we will continue. Back to the street in Charlotte Amalie which the Danes called Dronningens Gade. We are near Market Square on the west end. Here under the shade of the portico, on days when there are no ships in the harbor, it is pretty quiet. You may meet a dreadlocked Antiguan Rastafarian selling sugarcane juice. Other migrants from islands such Granada or Barbados may be playing dominoes or cards. As part of the American Virgin Islands, with its relatively strong economy, St. Thomas attracts immigrants from all over the Caribbean. And Market Square today is certainly a quiet peaceful setting. Nothing unusual about ragamuffins sitting around. But a few centuries ago at the same spot was the largest slave market in the Caribbean. Thousands of tourists pass through without knowing. Walking east on Dronningens Gade, you’ll find numerous shops selling electronics, cheap liquor, and jewelry. This is the heart of the town and the reason why most tourists visit the city. St Thomas has no sales tax and these shops are also packed when cruise ships are in port. It is all just a matter of numbers. The island houses approximately 52,000 all-season inhabitants. When cruise ships are in town, the total number of people on the island can swell by a whopping 10,000. The local economy on the island relies on these tourists. The islands also rely on the sale of the rum, Cruzan, which is made on St Croix. Consequently, a 375 mL bottle of the booze costs less than a gallon of milk. Oh and by the way, the milk is recombined from skim milk powder, butter, and water because apparently there isn’t a single dairy cow on the island. If you visit the island, you’ll also learn about “island time”. I’ve heard all the jokes about Indian Standard Time. But let me give you an example of “island time”. The first permanent establishment of the Danish West Indies presence is Fort Christian just off of Dronningens Gade. There is a sign saying that it is temporarily closed for restoration until Summer 2006. The building is fenced off. No one has taken down or changed the sign. It is there in 2010. In any case, as a desi, I found myself smiling when I noticed that almost all the jewelry shops on Dronningens Gade were run by diasporic desis. From what I could tell, some of these shopkeepers were Trinidadians, but many others came from India via the continental United States. (St. Thomas is, after all, a part of the U.S. Virgin Islands and has been since 1917 when along with St. John, and St. Croix it passed from Danish into American hands for the princely sum of 25 million dollars). Back on Dronningens Gade, you’ll also notice many alleyways heading towards the harbor. Most of the buildings in the alleyways running perpendicular to the main street are over a hundred years. Some of these used to be warehouses of pirates. Now, look around at the peaceful settings. In the same buildings where pirates hoarded stolen loot, desi shopkeepers sell fashionable wristwatches. Where slave-traders used to walk and sell human cargo, predominantly white credit-card carrying day-trippers buy tee-shirts from black vendors. Somewhere Bob Marley is having the last laugh. This entry was posted in desi, desi travails by Anirban. Bookmark the permalink. I felt like I was reading from a travelogue while going through the post. Got to know so much about the history of Charlotte Amalie and its quaint and quiet life. But I’m severely disappointed by the lack of pictures in this post. Put up a few more….c’mon!